The LAB is giving away a copy of Typograph.Journal Vol. 4 on Ello. How do you reference agility, balance and playfulness in a static form? How can a type system effectively embody the energy of a moving artwork? 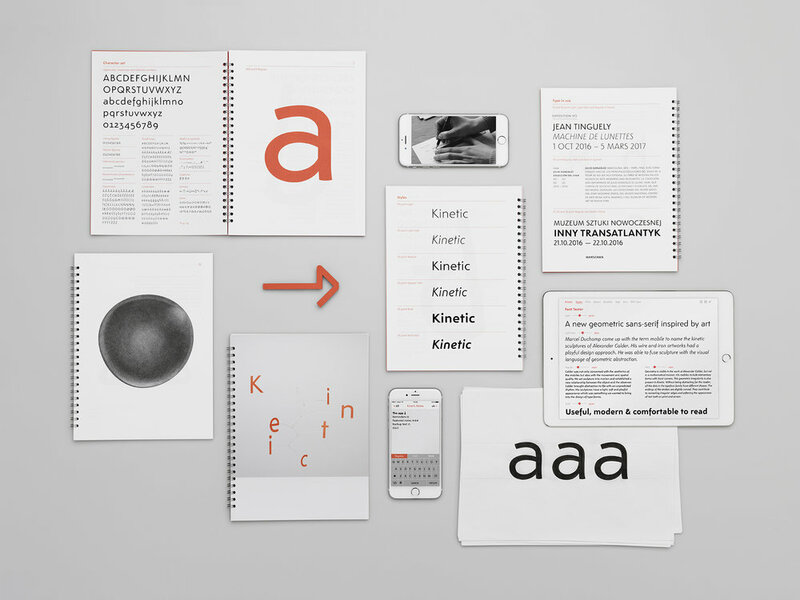 Kinetic is a typeface family created by Noel Pretorius and María Ramos which does all of the above. Alexander Calder was an American sculptor credited with creating mobile, a type of moving sculpture made with delicately balanced or suspended shapes that move in response to touch or air currents. Kinetic draws inspiration from Calder's work. The light, playful and soft appearance of these suspended sculptures was something the designers wanted to translate into each character. You can learn more about the concept, inspiration and production of kinetic in this short documentary. Geometric sans tend to look sharp and constructed. This is not the case of Kinetic, which uses geometry but avoids strict design patterns. By freeing itself from fixed mathematical constraints, and embracing organic movement the slightly curved terminals and the simplicity and openness of the forms make for a softer, visually interesting, yet highly functional sans-serif, suitable for a wide range of applications. Available in 3 weights with italics. It is a text typeface that was created with reader comfort in mind. Carefully constructed with sensitive optical corrections, kinetic performs well in print and digital environments. The italics reference cursive and most characters are constructed with a single stroke - this is also reminiscent of the bent wire used in Calder's kinetic sculptures. Maria and Noel first met at Reading while studying a master’s degree in Typeface Design. To create Kinetic the two designers (based in Sweden and Spain) worked remotely - using skype as their virtual studio environment! As 'NM type' the duo have released Kinetic independently and to launch the face they have created an app for mobile phones and a printed booklet to demonstrate how well the typeface functions in both print and on screen. The app, Kinetic Notes, can be downloaded for free from the App Store (https://appsto.re/es/jZdSfb.i). The printed booklet (includes the type specimen and an essay that explores the link between art, type and geometry) is available through the NM Type website. 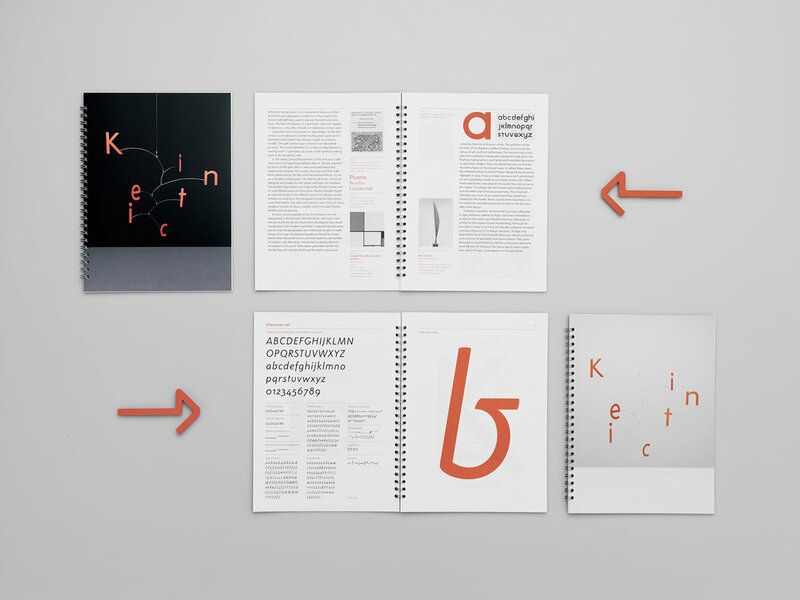 Kinetic will work beautifully in editorial and branding work at text and display sizes. Support this new foundry and do yourself a favour by adding an exceptionally well-crafted font to your toolkit by purchasing Kinetic here. 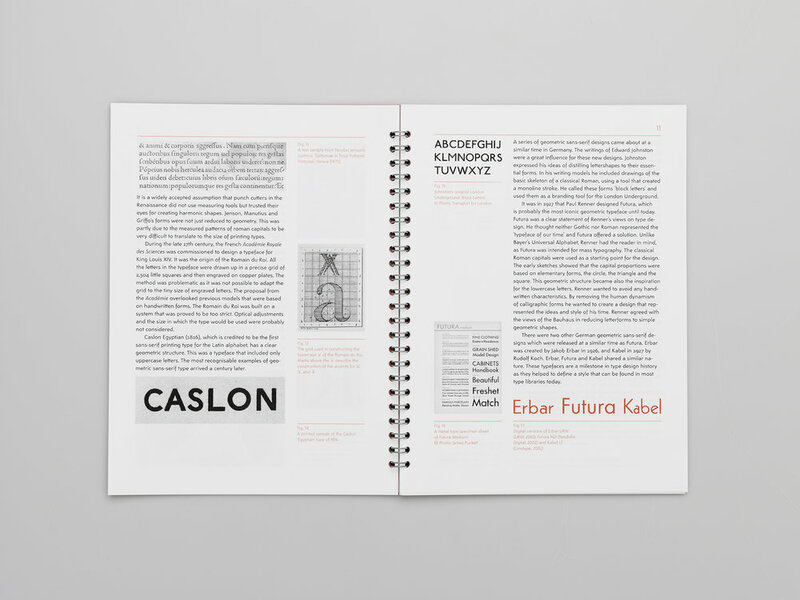 Newer:ReForm: Out Of Character – A Type WorkshopOlder:The LAB is giving away a copy of Typograph.Journal Vol. 4 on Ello.